SYRACUSE  The crisp spring air in Syracuse crackled with the sound of wood splitting and the smell of sawdust as the ESF’s Woodsmen’s Team took top honors at the East Coast Lumberjack Roundup March 29. ESF’s Men’s A, Women’s A, and Jack and Jill (co-ed) teams were the overall winners, beating teams from Paul Smith’s, Penn State, SUNY Cobleskill and Finger Lakes Community College. The meet featured a variety of events in team, doubles and singles categories. ESF fielded four teams that competed in bowsaw, cross cut, log roll and pulp toss. The three ESF pairs competed in splitting, vertical chop, and underhand chop. 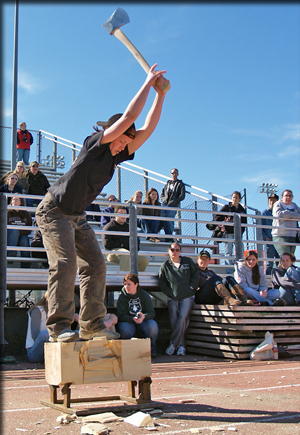 In the singles category, six ESFers competed in “meet the cut” (where a chainsaw cut is made halfway through from the bottom of the log, pulled out and then the competitor tries to meet the cut from the top of the log), hard hit (cutting through a 12x12 inch cant  square log  with the fewest hits), firebuild, axe throw, single buck (crosscut saw with one person), and Super Swede (using a bowsaw to cut three cookies off the end of a log). Traditionally the team holds its meets at Lafayette Road Experiment Station, but this year was able to compete at Manley Field House on neighboring Syracuse University’s campus. The Woodsmen’s Team has a close relationship with the field operations department at the Carrier Dome where the team does set up and teardown for every SU sporting event. Said club Vice President Ian Freeburg, “Being at Manley was great. It wasn’t muddy and there were bleachers,” which was good news for the couple of hundred people who attended. The day also featured hands-on events for children. Kids had the chance to search for pieces of candy in sawdust and do a mini-pulp toss. The club enjoys the honor of being the oldest student organization on campus, formed in 1912, one year after the college’s inception. ESF also has a Woodsmen’s Team at the Ranger School which competes separately from the Syracuse campus team.